“From the get-go, I wanted large paper flowers to create a Thumblina/Alice in Wonderland-ish effect for our garden reception. My amazing mom came up with the brilliant centerpieces by creating a pattern, which we then duplicated about 30 times for all the centerpieces, walkways, and stairs. The great thing about paper flowers is that we could create them with plenty of time before the wedding without worrying about the wilting. 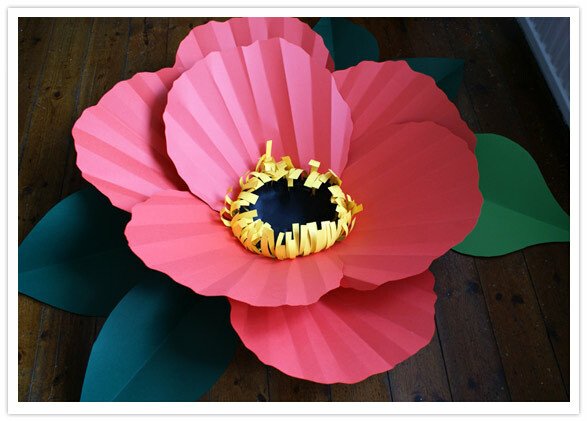 That said, by the wedding day we then had 30 huge paper poppies “growing” in our house and we were plenty ready to get them out! Making the flowers is easy as pie. You’ll need a large surface to work on because these babies are quite large. 1. The base of the flower is 9” wide so you can start by marking the middle of the short end of the paper at the 9” mark and then marking 4½ inches out on either side. 2. Create the shape of the petal. You can either copy this picture and blow it up to the right size or create your own. (I drew it in marker here to so it would be clearer, but use pencil to be more inconspicuous.) It’s roughly the shape of a light bulb or shell with lots of undulating waves (you don’t want them to be too precise, they’re flowers!) From the 9” mark on the short side of the paper draw a 5” line up the middle. 4. Create the texture for the petal. 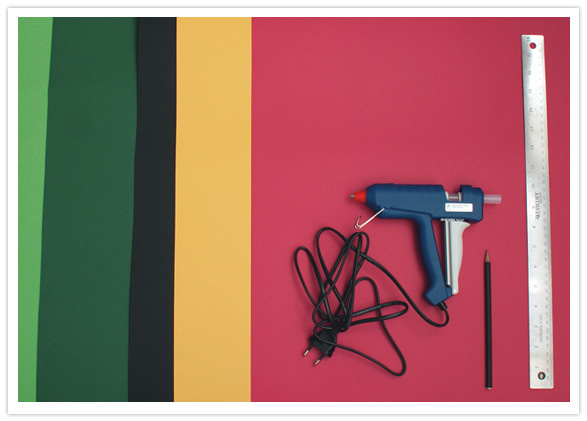 We kept it simple by simply folding the paper over the ruler from the widest rim to the center of the shortest side. Space them out about every 1-1 ½ inches. Remember not to be too precise. Then, turn the petal over and turn every other fold the opposite way like an accordian fold. It might look a little too much like a sea shell at this point, but don’t worry, it gets better. 9. 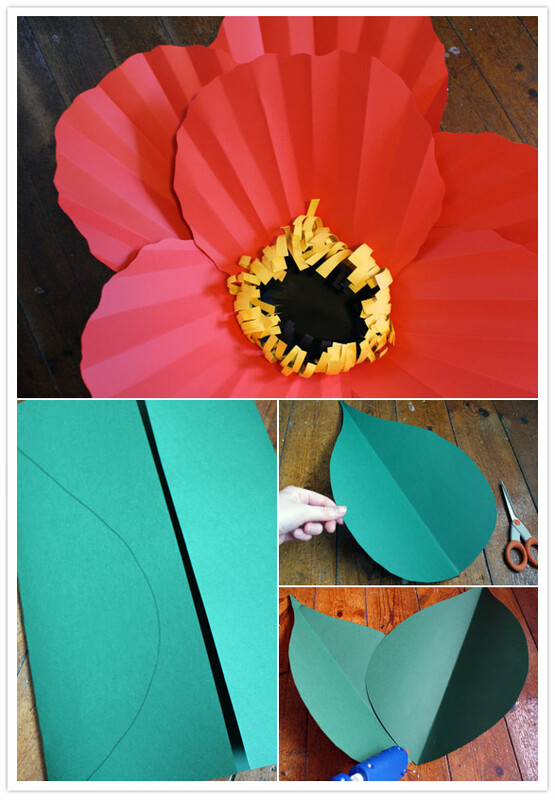 Create the stamen by drawing a 16” circle from the yellow sheet of paper and cutting it out. 10. 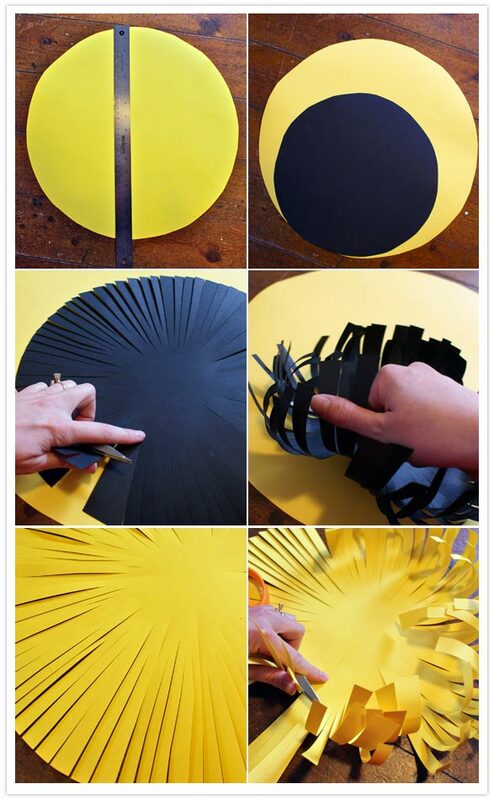 Create the center by drawing a 10” circle from the black sheet of paper and cutting it out. I found a 10” bowl to trace. 11. Cut 3” strips around the perimeter of the black center at every ½” mark or so. 12. Do the same to the yellow stamen, about 5” strips. 16. Make the leaves. Using the 25” as the width and the 19” as the height, fold the edge into the center. Do the same to the other side. This will create 2 leaves. 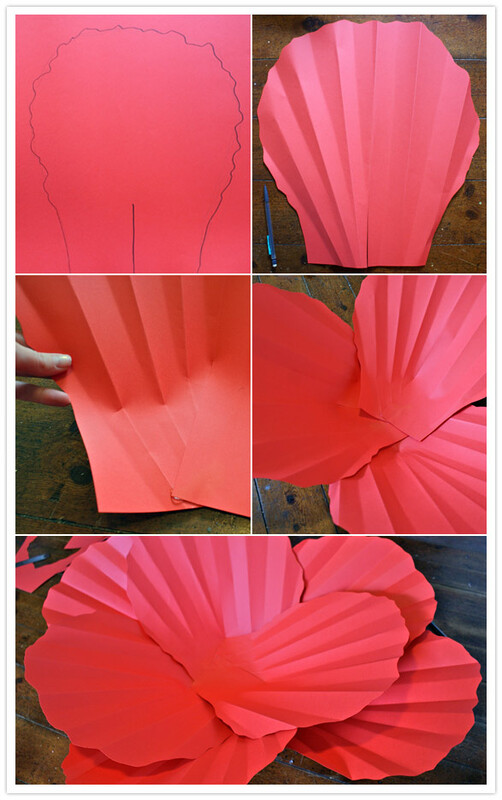 Use the fold as the center of each leaf and draw a half a leaf shape. 18. Glue two leaves together. Make as many leaves as you would like. I used 5 in a few shades of pastel and deep olive greens.